Uma cabana pitoresca e confortável em 3 hectares de bosques localizados na Associação Watchaug Heights. A sala de estar, sala de jantar e cozinha é um projeto aberto espaçoso, com um sistema de iluminação indirecta especial sobre interruptores dimmer para criar o seu efeito desejado perfeita na madeira acabado pinho tecto abobadado. A sala de jantar tem uma porta deslizante que se abre para um deck quintal privado. A cabine inteira é terminado com paredes de pinho amarelo e piso de carvalho em toda a cabine. A cabine fica afastado da estrada com muita privacidade e árvores para desfrutar. A área de Charlestown é um local de férias ideal, com muitas atracções nas proximidades. Veja a Câmara de Comércio links neste anúncio. A cabine é um curta de 15 minutos para o Charlestown Breachway que caracteriza uma das mais belas praias de frente para o mar na Nova Inglaterra para a natação no verão e pesca do robalo grande despojado no final do verão / início do outono. 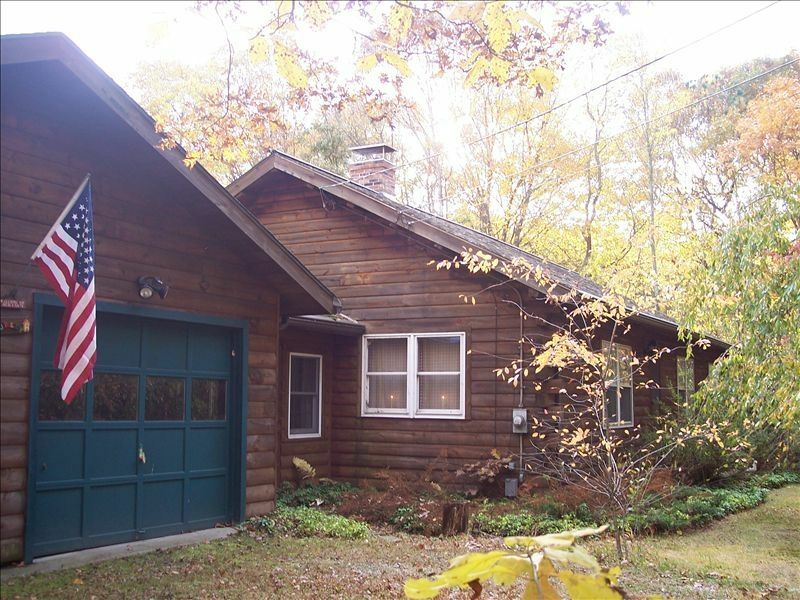 We had a wonderful time in a beautiful log home with a large yard in a quiet peaceful setting just minutes to shops and the beach ! The home had everything and more than we needed for a great vacation ! Can not wait to book again !! Thank you Scott !! We enjoyed our stay at the cabin. Scott was very nice and made himself available to our needs. Weather was great and we took advantage of the fire pit. Would definitely book again! Neat log cabin with exposed beams. We love the small lights on the beams that show off the vaulted ceiling. We enjoyed the fire pit, lake (gorgeous and very close by) and beach (fun waves, about a 10 min drive). Scott Hurley was extremely easy to rent from - answered all of our questions and was so hospitable. Thanks for a great vacation! Just like home... had planned for this to be our 'home base' to our beach comings & goings - but the cabin served us well on the one rain-day. Lots of room. Would plan a return visit in the future along with recommendations to others. The house was in a lovely private setting. There was plenty of room for outdoor family games. Likewise Inside the house allowed for groups or individual pursuits. We did not take advantage of the lake during our weekend. Location allows for pretty easy access to other area activities. The owners were pleasant and helpful. The house is fairly shaded and there are no air conditioners necessitating use of fans and leaving Windows open. This creates a dampness that can be felt in clothing. There is no washer but more importantly no dryer - anything wet gets thrown over things to hopefully dry. No WIFI these days, especially with kids can be difficult. Double bed could use more supportive mattress. We really enjoyed our stay at "the cabin". It is in great location to be able to visit any of the Rhode Island beaches. Also the lake beach is within blocks of the cabin that you can walk to if you decide. The water at the lake was like bath water and so refreshing. Beach area is clean and wonderful area for a family with young children. The older children can also enjoy it as well. The cabin open concept for the kitchen, dining and living room is terrific. Although it was only 2 of us I can see a family enjoying the open concept. The owners were very nice and available if needed. A rental contract will need to be executed to reserve desired dates.